Have you taken out a personal or payday loans online and now you’ve been trying everything you could to pay off the debt with a low income? Perhaps you have a huge debt on your credit card and you’re scared to death because your monthly earning can’t afford it. Now, what shall we do? You owe a loan but, you are earning a low income and as a result, you are finding it difficult to pay it off. You’re not alone. Though we’re far apart, I know how you feel. You lie in bed awake at night, because of them. Your debt weighs you down. Don’t be confused. Don’t worry. You’re about to solve the problem. You’re about to know how to pay off debt with a low income. That’s exactly what this article is about. Loan repayments can take years if the borrower doesn’t know how to get out of it. Nonetheless, you can get out of your debt. Yes, it seems difficult but with this section, you’ll find it easy to do so. The latter provides you with tips to pay off your debts faster. As we proceed, each tip will be explained. Don’t Take More Debts: Live within your limits and handle your money. Don’t spend beyond your means. Stop using your credit cards. Freeze them. Don’t make things harder. If you increase your debt, your financial life will squeeze and you’ll be hurt badly. Focus on the debt you owe and put all your strengths to pay down the latter. If you grow your debt, you’ll find it difficult to bear with it. Create a Debt Hierarchy: On a list, arrange your debts in order based on their interest rates. Higher interest rate debts should be at the top. Pay the first on the list, then the second and so forth and so on. This is an effective way to get out of debt in time. With a debt hierarchy plan, you’ll find it easy to control your finances and know what to do at a specific time in terms of a loan repayment. Interest is crucial. It can increase your debt payment. It does it drastically. Permit me to give an instance. That’s how bad an interest can be. So, it is wise to pay off the debt with the highest interest rate by using a debt consolidation method. Reduce the Interests: You may ask: “Why should I lower my interest rate?” You should. It helps you get out of a debt faster. Just process a balance transfer. Move the balance from your credit card to another bank’s credit card account. If you do that, the new bank will reduce the interest on your balance but before doing that, check a list of the credit card companies. Evaluate their lower interest rates for new customers. Choose the best out of them. It’s that easy. Also, ensure that you have read the company’s terms and conditions so that you don’t fall for a bait. Break the Extravagant Habit: Live on a low budget. Don’t spend much as you know that you are on a debt. Only spend on worthy things. Minimize your spending and cut the fast food. Quit the parties as well. Sell Your Old Properties: If you really want to get out of debt fast, sell goods you have, but you don’t need. It’s a quick way to raise a fund which you can use to pay down your debt. Just check your house. Look into your wardrobe. Gush out the old-fashioned trends of clothes you no more wear. Gather the old electronics you no more use. Check your garage. Get car parts. Gather all kinds of stuff that litter your house without any specific reason. Sell them off and raise money. Use the fund to pay off your debt. And you know something? The Internet is helpful. There are plenty of online marketers ready to help you sell your old properties. Contact one of them and make a deal. Sell your stuff. Have your money and pay off your debt. It’s that simple. Find a Part-time Job: Expand your source of income. It will help you raise money. By doing so, you’ll find it easy to pay off your debt. Take up part-time jobs on holidays. Do seasonal jobs. Earn more money. Be dynamic and flexible. Get some extra cash, accumulate it and extinguish your duties. There are seasonal greenhouse works. There are farm works, emergency plumbings, online freelancing and many other temporary works. Get one. It’s within your reach. Perhaps you think all these things are stressful and you want to back down. Read the next section and understand the reasons why you need to get out of the debt asap. Why do you need to get out of debt? Do you want to become debt free? Don’t back down yet. Being in debt can be terrible. Use all the tips you were provided earlier to get out of a debt as fast as you can. Don’t be discouraged because it takes a lot of work. Yes, it takes effort. Give it what it takes. Open your eyes. Close them. Look inside you. Imagine how your life will be if you were debt free. Get a paper. Write down the reasons why you need to get out of debt fast. However, the common reasons are mentioned as we proceed. A debt can stop you from saving money. Get out of it and you’ll be free to plan your financial life. Being on debt, prevents you from spending on whatever you wish. Make a purchase you don’t really need and you’ll feel guilty because you just increased your debt. But if you were debt free, you could freely spend on things you enjoy without any blame. Debt can wake you up at night. It can make you lie awake all night as it can lead to extra stress. Stress can damage your health in a way that it could lead to a heart attack. It can cause migraines so get out of it and save your life. A debt can take your properties away from you. Your mortgage lender owns your house. Your auto loaner owns your vehicle. Your tuition loaner owns your career. Until you pay off your debts, you cannot be left in peace. Most importantly, a debt can squeeze your credit score. And it’s the major reason why you need to get out of it. Much is discussed on this issue in the next section of this article. Debts can eat up your financial life as they can affect your spending power. Deaden your financial clout and you could find it hard to even borrow money because your credit score will be affected negatively. The greater your debt, the lower your credit score. The credit score is important. It shows how close or far you are to balance your debt. Pay up your debt and you’ll get a better credit score. Don’t pay up your debt, and you’ll get a bad credit score. Let your credit score rise. Lower your credit utilization and don’t let your credit score suffer. Meet your monthly debt payments and void losing credit score points. Don’t let your debt be delinquent. It can cause a lasting damage on your credit score which can take several years for it to repair. It is preferable to consolidate your debt or take up credit counselling as they cannot affect your credit score severely. Just ensure you are debt free. You know. The thing has two ways. Firstly, your credit card can be on a revolving debt. In that case you’re permitted to borrow as much as you want until you reach your credit limit. Keep in mind that with this situation, your interest rates also grow bigger. Secondly, you have taken out an installment loan. Here, the interest rate is fixed and the monthly repayment is also constant. In any case, you must meet your monthly repayments. You have not to miss a single one so that you will not fail to repay your debt. If you do, it’s a terrible mistake and it can damage your report because your lender will send a report to the credit bureaus. The harm remains on your credit history for several years. Stop enlarging your debt. Know the amount of money you owe, with its interest rates. Make sure to follow a good budget plan that will get you out of the latter as fast as possible. Cut your expenses and pay off your debts. Consolidate your credit cards with a balance transfer and take up temporary jobs to raise the funds to pay down your debt. Just be debt free. This article is helpful as it shows you why you need to get out of your debt, how to get out of the latter, and how your debts affect your credit score. Even with a low-income, you can pay off your debt fast by keeping in mind all the aforementioned criteria. 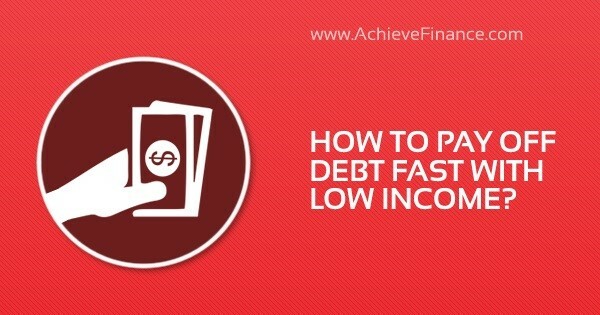 How To Figure Debt To Income Ratio? How To Consolidate Credit Card Debt With Bad Credit?